As Herman Moll acknowledges in his preface, William Stukeley presented him with the design of the 1723 map. By this he obviously meant the internal Roman Road layout which had been part of the research by W. Stukeley at the Society of Antiquaries. This information came from several documents of Roman origin. That Herman Moll’s second engraving of the same coastline differs from the first within the margins of the engravers capabilities only whilst using a different scale bar, is a tribute to Moll’s work. This paper examines the two maps and their antecedents, and the differing Mile units. Thus we have the basic information which was used to compile the map, “Itinerarium Antonini Augusti Iter Britanniarum”. This is a compilation of many “Iters” throughout the Roman world and includes 15 ‘Iters’ for Britannia. However the map information comprises much more than that data, and before a comparison is made it is necessary to indicate the other data available in the eighteenth century. 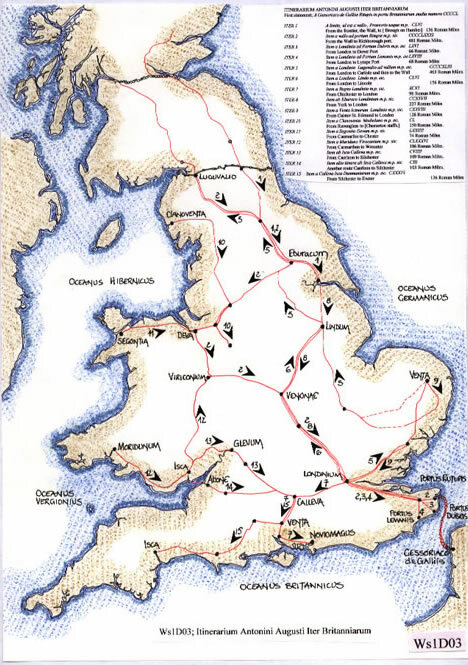 That the Roman Army prepared and used maps is now accepted. The fact that they were perhaps copied and available in the first monasteries, by either originals already in Britannia or having been brought back to Britannia by peripatetic monks, is not known. The Venerable Bede mentions that a “Cosmographiorum codici mirandi operis”, or “Book of the cosmographers”, was extant then.(Tp1). Ravenna Cosmography. A compilation of circa 700CE based on the itineraries. Notitia Dignitatum tam ciuillis quam militaris. A 5th century list of official appointments. These and observations by Stukeley on his travels no doubt formed a basic building block for the map. 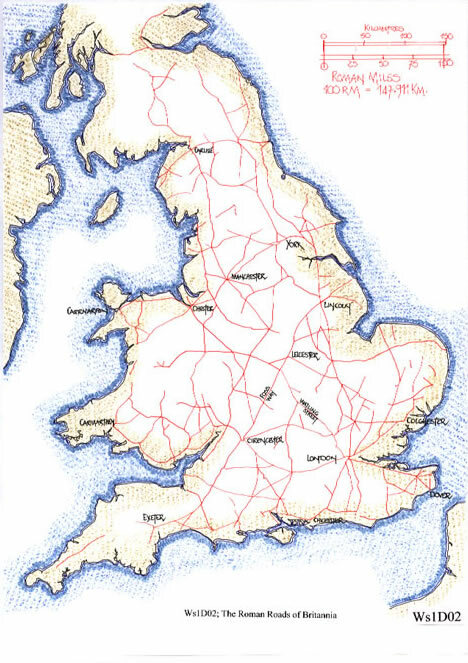 Many Roman roads were still in everyday use, but it took a dedicated scholar to recognise those which were not in fact documented as such. 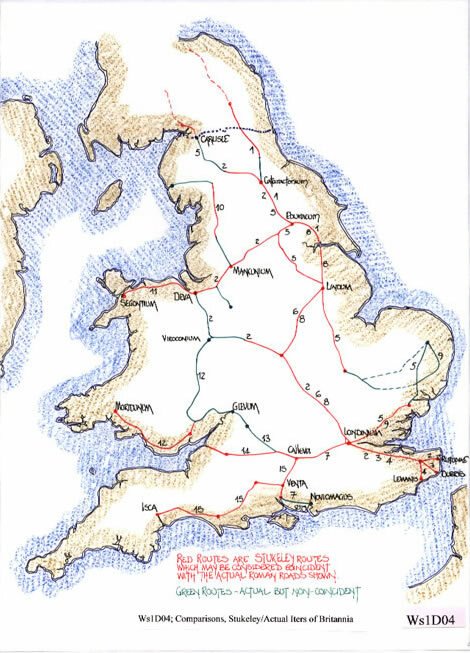 Indeed possibly the most well known British Roman Road, the Foss Way was not used for parts of its route. Many others were mere marks on the land surface. There then follow the 15 ‘Iters’, many of which are in fact duplications of what would have been well known routes in Roman times. Some are even short individual stretches of road route. This data would have given Stukeley an excellent insight into just what a Roman Road comprised and enabled him to identify many others. However in wrongly identifying some Roman place names he has created a map which is both excellent and unfortunately very mis-leading. The maps have been aligned at Cantium Promontory, the ancient designation point for the positioning and dimensioning of Britannia. Here it can be seen that the general form of Moll’s map for Stukeley is quite accurate and the actual road positions in many instances follow each other. The discrepancies however begin to show quite markedly and are a pointer to the mis-interpretation of the original Roman place name by Stukeley. That he was so nearly correct is a tribute to his scholarly activities with attention to detail. The actual Moll map for Stukeley is only some 245 x 272mm, i.e. an A4 page in height and c1.25 wider. It has a scale bar in Romana Milliaria of 80 RM length which measures c21/16 inches. However, when the latitude scale is measured against the bar it is precisely 69 Romana Milliaria. The geographical world can be fairly described as being 69 Statute miles per Latitudinal Degree. Therefore Stukeley has asked Moll to engrave the map to the actual Statute Mile scale but named them, no doubt for effect, Romana Milliaria. The 69 RM measures c1.75 inches, but we must be cautious as to the INCH accuracy. If we calculate as follows; (1.75 ÷ 69) x 80 = 2.029 inches or 2 1/32 inch. This is a 3 % in-accuracy. The scale at 55N is then 39RM and at 50N, 44.35RM, which may be translated as 1 inch and 13/16 inches. But in preceding papers it has been shown that the Roman Survey of Britannia positioned certain civitates and Legionary Forts to a precise triangular arrangement. Thus Chester/Deva was 200 Mille Passum west of Cantium Promontory and 150 Mille Passum north. The Roman world was known as 75 Mille Passum per latitudinal degree and thus Chester/Deva was also 2 degrees north of Cant. Prom. 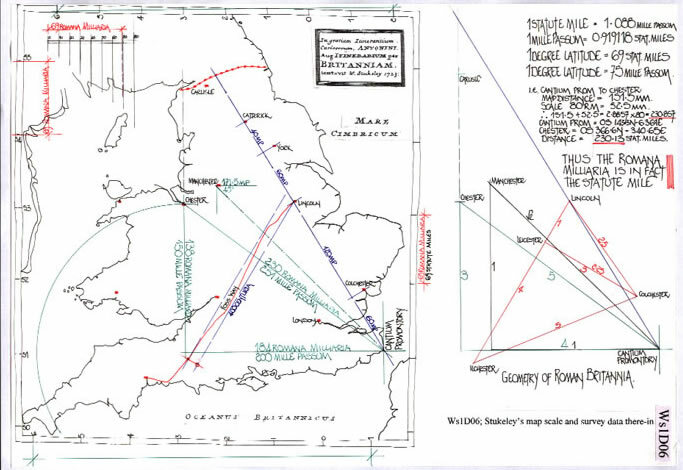 The map of Stukeley agrees with this triangulation and as indicated on diagram Ws1D06 the calculated distances are quite precise. 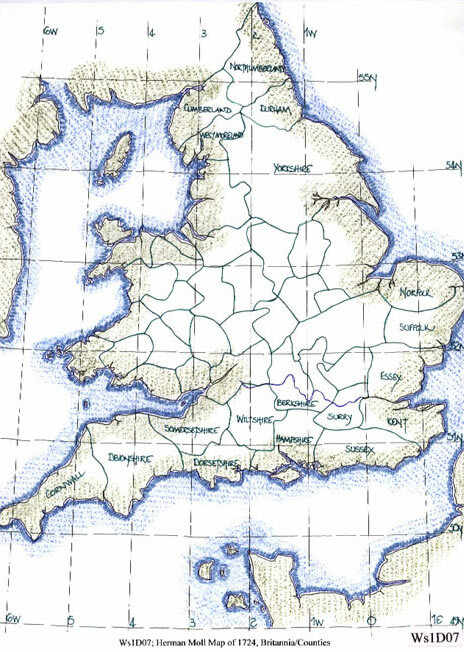 The construction of a map using Roman survey data as a forma for the shape of Britannia is also appended indicating the probable origination of the data. There has been considerable discussion in texts about cartography concerning the length of the Mile in the 16th to 18th centuries. It has variously been 5000 feet, 5280 feet and 6336 feet. But here we can conclusively state that the Statute Mile of 5280 feet was used as the drawn scale for the 1723 map. This map which is so very similar to the Stukeley map of 1723 has an expansion factor to the longitudinal width of Britain of approximately one degree. This may be seen as a hang-over from the change in longitude measured from the Christopher Saxton map of 1579 to the Joan Blaeu map of 1665, where there is a 115% expansion, as explained in text Cs1, and Cs1D11. Herman Moll is generally thought to be Dutch by birth but may have spent time in Germany and thus known this map. This expansion is gradual over the whole south coast of Britain, but, is most marked in the counties of Devon and Cornwall. 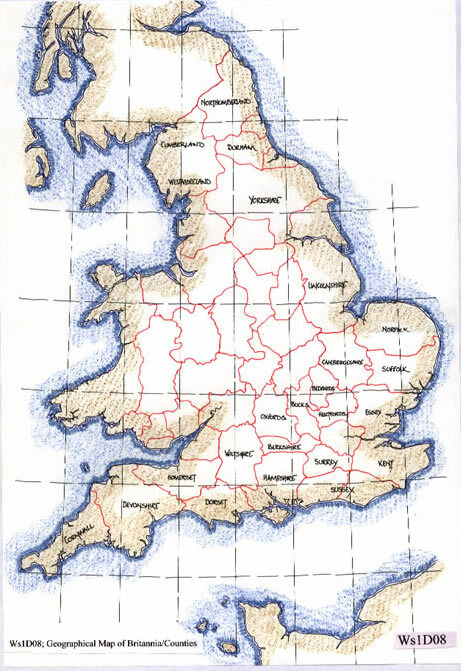 The geographical map of England and Wales is drawn to the same scale as the Moll map, and it can be seen that the longitudes are quite comparable. 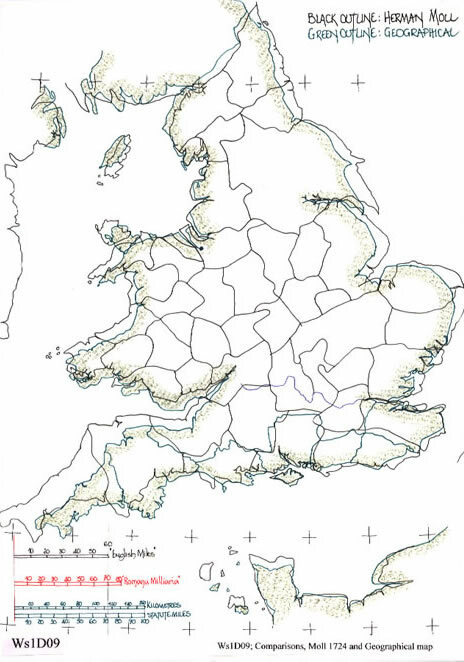 But when they are drawn super-imposed as diagram Ws1D09 shows, the longitudinal expansion and over-sized Cornish peninsula becomes apparent. The map scales of all three maps are appended for comparison. For his map Moll has chosen 11/2 inches for the latitudinal scale and then 7/8 inch for the north and 1 inch for the south of the map. Thus the map is composed in a ratio of 7:8:12. The actual scale bar is drawn noted as English Miles, and has 60 marked there-on. Unfortunately I think the scale bar has been corrupted by its drawn position, with the 6 degree west line interfering. This has in fact meant that the 60 English Mile overall measure is just too long. From the zero position to the 6 degree line it is actually 1 1/2 inches, the same as the latitudinal scale. If that supposition is accepted then the “English Mile” scale is in fact using a Mile which is 1.15 times the Statute Mile; i.e. latitude scale 69 Statute Miles divided by 60 English Miles equals 1.15. That 1.15 is the expansion factor from the Saxton Map to the Blaeu map. As has been stated both maps are surprisingly close in their overall plot with only minor discrepancies of detail on the coastline. 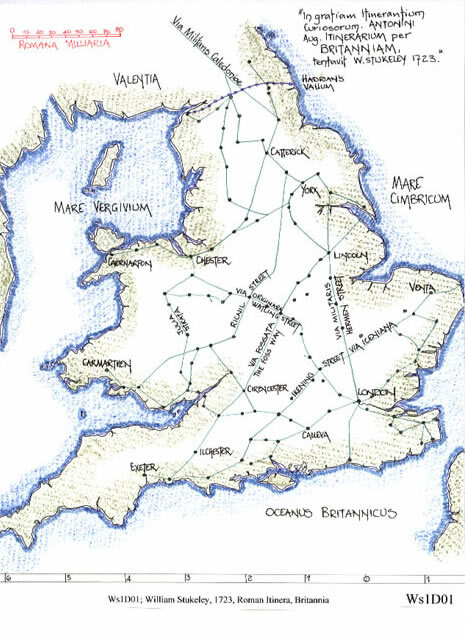 They both use the Roman triangulation of Chester as a basic marker for their setting out and have the Cornish peninsula set northerly and overlong. The scales compare favourably when properly aligned and thus indicate that these maps were drawn by choosing a latitudinal scale of known length based on the INCH measure and then the longitudinal scale was approximated to the cosine ratio, but using a part inch, eighth, sixteenth or other to enable it to be drawn. There was no large ratio scale involved as we may expect to read on today’s maps. Herman Moll was obviously a very skilled engraver and accomplished cartographer. 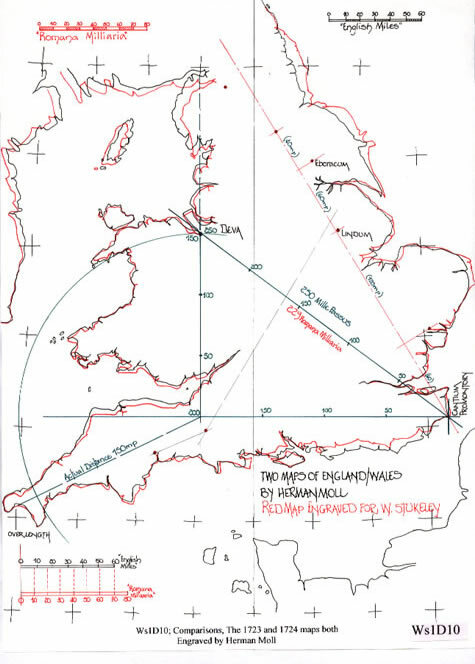 His book or atlas of the ‘Counties of England and Wales’ contains some highly accurate information and was the precursor of the triangulation surveys of the late 18th century and the early Ordnance maps. William Stukeley was the first person we may call an archaeologist in that he sought to explain the mysterious constructions which litter the British landscape. He also sought to record these findings in such a way as to be accessible to the many, with texts, drawings and diagrams and of course maps. Without these two great men meeting in London and befriending each other we may be the poorer in our understanding of our ancient past. 1B Ferrar, Michael J, (2008), ‘The Gough Map; An Investigation’. Text reference Gm1 on site. 2 Delano-Smith, Catherine and Kain, Roger, J P, (1999), ‘English Maps, A History’. University of Toronto Press. Chapter 3: Mapping Country and County, discusses the sixteenth century surveying and mapping knowledge. Christopher Saxton’s maps are dealt with in detail, page 66. Herman Moll is mentioned in passing. 3 Frisius, Gemma, (Antwerp 1533), Libellus de Locorum Disribendorum Ratione. Methodology and triangulation in written form for the first time, but perhaps not the first usage! 4 ibid note 2.see page 61, potential mapmakers. 5 Tyacke, Sarah and Huddy, John, (1980), Christopher Saxton and Tudor Map Making. British Library, London. 6 Wiseman, Timothy P, (1992), ‘Julius Caesar and the Mappa Mundi’, in, ‘Talking to Virgil’. Exeter University Press, Pages 22-42. The Roman World Survey of 55-18BCE is discussed. This paper has been updated and is text reference StM1 on this site. 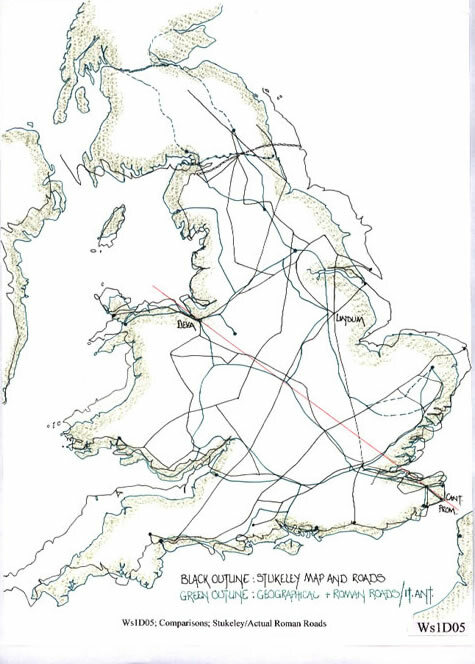 8 Ferrar, Michael J, and Richardson, Alan, (2003), ‘The Roman Survey of Britain’. British Archaeological Report, Bar 359, Oxford. 9 Stevenson, Edward L, (1932 and 1991), ‘Claudius Ptolemy, The Geography’. 10 Connor, R D, (1987), The Weights and Measures of England.Trustees of the Science Museum, London, HMSO. Chapter V. The Mile and the League. This is a full discourse of various measures, the melange of Roman and English units and the mistaken translations of those. 13 Rivet, ALF and Smith C, (1979), “The Place Names of Britain”, B C A 1979 and 1981. Text includes Antonine Itinerary, Notitia Dignatum, etc. 15 Bede, “Ecclesiastical History of the English People”, Penguin Classics, 1955/1990. See also The Lives of the Saints, Liber 2, chapter 15. Internet Latin version now available of text. 16 Diodorus Siculus, “Historia”, internet available, out of copyright. Julius Caesar, “The Conquest of Gaul”, Penguin Classics, 1982. In,” Aufstieg und Niedergang der Romischen Welt” (Eds., Haase, W and Tempotini, H.), De Gruyter, Berlin, pp534-562. Herman Moll is responsible for many great maps of the World and its countries. One these, a map of New England including New York, is dated 1721. His first atlas was published in 1710 and his Atlas Minor was again published in 1729. “This confirmed me in the opinion I have long entertained, that the maps and charts place this country at least three degrees more to the east than it really is; which thought I communicated many years ago to my worthy friend, Mr HERMAN MOLL, and gave him my reasons for it, although he has rather chosen to follow other authors”. There is no doubting Herman Moll was a man of some consequence in 18th century London.